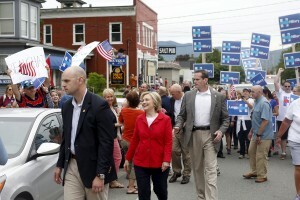 WASHINGTON — Earlier this year, Hillary Rodham Clinton’s campaign lost count of its experts. In the months before she began her second run for the White House, Clinton spent hours quizzing economists, lawyers, educators and activists about everything from executive compensation to the latest research on lead paint. By last fall, the number of experts she had interviewed hit two hundred and her team stopped keeping track. The Democrat isn’t an incumbent, and even with competition that’s resolute but still far from offering a serious primary challenge, Clinton has a luxury few candidates enjoy: time to hit the books. The results have started to emerge, and Clinton plans to add to them by releasing a new domestic policy proposal nearly every week this summer. To be sure, politics are at play as Clinton shapes her agenda. She is sidestepping foreign affairs, which has consumed much of the early debate among Republican White House hopefuls eager to paint the former secretary of state with President Barack Obama’s record on the world stage. She is not yet offering specifics on subjects where consensus among Democrats and independent voters will be harder to find: trade, limits on executive pay, regulating the country’s finance industry, raising the minimum wage to $15 an hour. What Clinton debuts in the coming weeks will form the core platform of her campaign and, should she win the nomination and the presidency, her administration. It’s an agenda Clinton describes as that of a “pragmatic progressive,” centered on families and focused on economic growth, innovation and income inequality. Most especially to those who wanted Sen. Elizabeth Warren, D-Mass., to get into the race and are now packing town halls held by Vermont Sen. Bernie Sanders, an independent running for the Democratic nomination from Clinton’s left. Clinton’s challenge is to craft positions that will satisfy that grassroots segment of her party, but won’t also vilify the wealthy – particularly the donors she’ll need to pay for a campaign expected to cost $1 billion. So while Clinton consulted progressive champions, including Columbia University economist Joseph Stiglitz and New School labor economist Teresa Ghilarducci, she’s also talked with Democrats with close ties to Wall Street, such as former Treasury chiefs Robert Rubin and Larry Summers. It’s a reach-deep approach aimed in part at correcting mistakes made during Clinton’s 2008 campaign, which was criticized by some Democrats for being too insular. Aides began pulling together briefing books last year. Her campaign says work by Harvard University sociologist Robert Putnam, the author of a book on childhood poverty and the “opportunity gap,” and Brookings Institution fellow Isabel Sawhill, who studies the decline of marriage and income inequality, particularly influenced Clinton’s early thinking. Since then, Clinton’s research has continued in meetings, phone calls and emails with individual and larger groups of unpaid, informal advisers. Some have known the Clintons for decades, while others who are newer to the circle. Harvard Professor Raj Chetty, an expert on social mobility, guided Clinton through slides on research into how children in certain areas of the country are more likely than others to get ahead. Heather Boushey, president of the liberal Center for Equitable Growth, provided data on the economic impact of the growing number of female breadwinners. Those who have met with Clinton say she often questioned whether their policy ideas can be “scaled up” to a national level and also used the gatherings to run her own ideas past outside experts. The results of the research are evident in the campaign. While talking about race relations during a visit to an African-American church in Missouri last month, Clinton detailed the impact of lead paint poisoning on young children. A speech to a Latino organization in Las Vegas earlier this month featured data on how many words children hear by the age of three. At stops in New Hampshire, Clinton frequently mentions the average debt burden for students in the state.